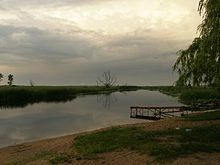 Biebrza (Lithuanian: Bebras, Belarusian: Bobra) is a river in north-eastern Poland, a tributary of the Narew river (near Wizna), with a length of 164 kilometres and a basin area of 7,092 km2 (7,067 in Poland). The region is usually divided into lower, central and upper basin areas, each with its own different characteristics. 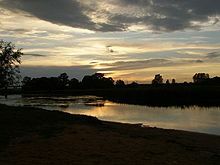 Today the river is best known for the vivid wildlife in the peatbogs and marshes in its flooding areas. Historically, the borderland regions of Masovia and Lithuania, the area retains much of its cultural diversity today. 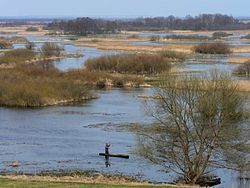 The basin of Biebrza river is inhabited not only by hundreds of rare and endangered sorts of birds, but also by people representing diverse cultures, languages and religions. While most of the population of the region speaks standard Polish, some people in the upper river basin (municipalities of Lipsk, Dąbrowa Białostocka and partly Sztabin) speak a local dialect of Belarusian (called by them prosty jazyk - "the simple language"). The people there belong to the Orthodox or Roman Catholic church. On the north bank of the upper Biebrza there are also a few villages where so called "old-believers" live, who speak an archaic dialect of Russian. Some of these communities preserved much of their traditional culture in spite of a long lasting communist government policies aimed at assimilation of non-Polish cultural and linguistic minorities. This page was last edited on 8 June 2018, at 11:59 (UTC).